Sometimes you’re in the right place at the right time, and Friday was one of those times. 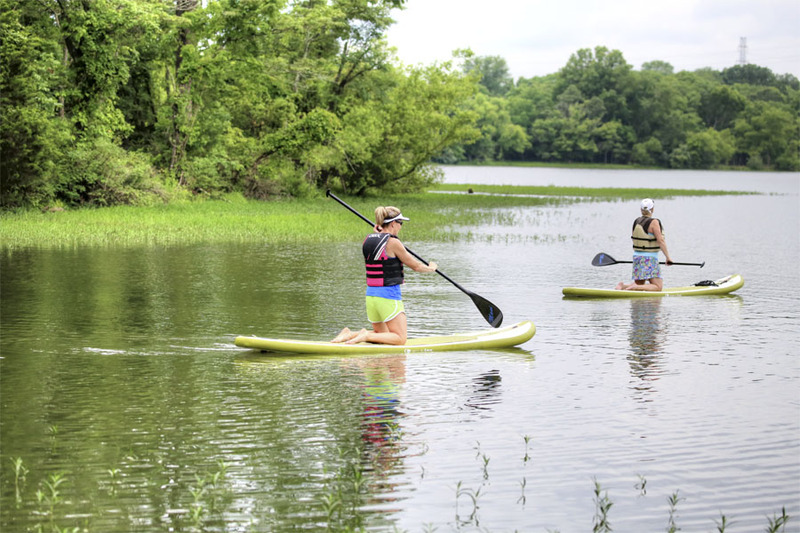 I had just finished training my last client of the morning when, while scrolling through our MRTT Facebook page, I saw a post from someone I didn’t know asking if anyone wanted to join her on Saturday morning for some stand up paddleboarding on Beaverdam Creek Reservoir. She had two boards and would love some company since her usual SUP buddy was out of town. 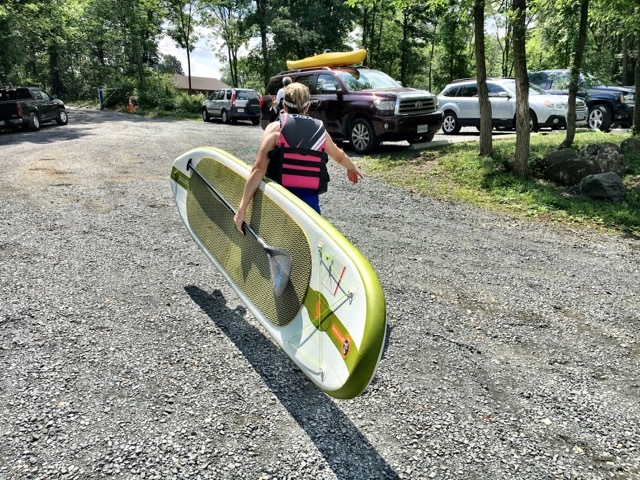 Since stand up paddleboarding has been on my bucket list for several years, I jumped at the chance! 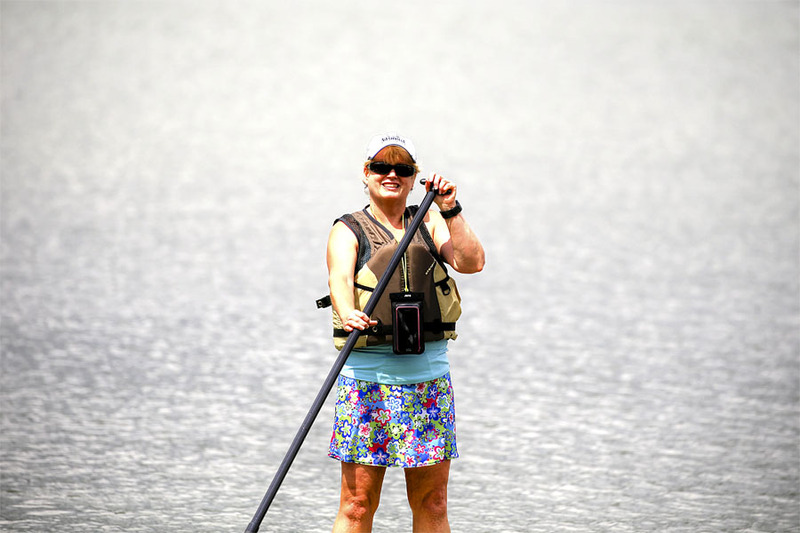 When Bill and I got to the reservoir on Saturday morning, we followed the sounds coming from a whirling little motor to Crystal who was busily pumping up her paddleboards (affiliate link) using a car battery air pump (affiliate link). After quick introductions, she continued pumping up the board, and in a matter of minutes each board was pumped up and ready to use. With a quick snap our paddles (affiliate link) were assembled, and we took off with our boards and paddles to the launching area. Bill positioned himself on a rock to take pictures as Crystal gave me instructions on how to get my board into the water and then kneel on it to paddle out into the deeper water before standing. Crystal was a great teacher explaining to me what to expect, how to stand up, and reminding me that I could get back down onto my knees or my bottom if I got tired of standing. After a few more instructions, Crystal stood, reminded me to keep my knees slightly bent for easier balance, and encouraged me to stand. She made it look easy, so I put my hands down, tucked my toes, got into a semi downward dog position, and then gingerly stood. 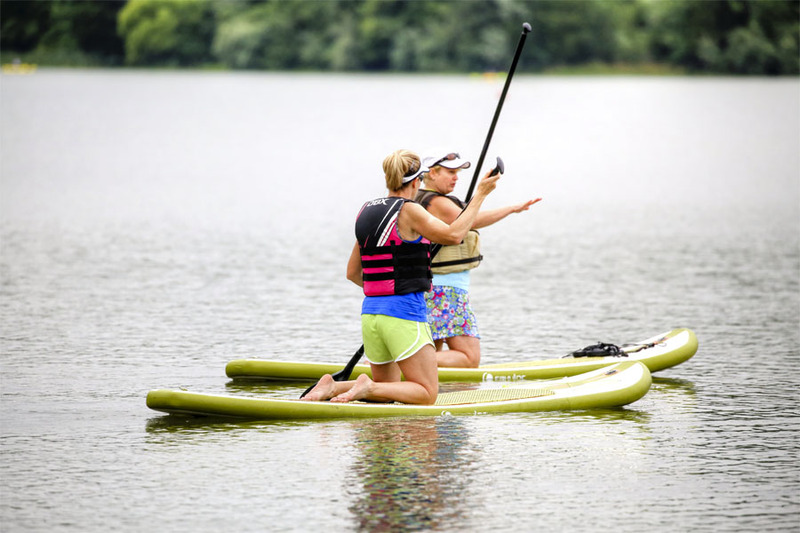 I was thrilled to stand up without falling and making a spectacle of myself since there was a small SUP class going on nearby and everyone seemed to be quite proficient in that group. After a few minutes I got comfortable and shifted my gaze from the front of my board to the beauty around me. 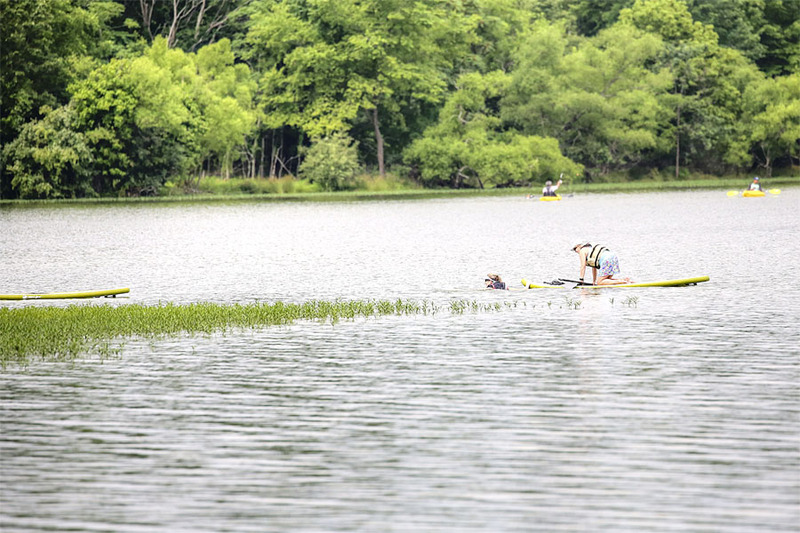 I was cautious, but as we paddled along I became more and more comfortable and relaxed into the steady rowing motion that propelled us along the top of the lake. As I sunk toward the bottom of the Potomac I realized that I needed to calm down, make my way back to the top, and doggy paddle, float on my back, or do whatever necessary to save myself. I popped out of the water, saw a ski nearby, and flailed through the water with my best attempt at swimming until I got to the ski. It gave me just the right amount of buoyancy and confidence I needed until the boat swung back around and picked me up. 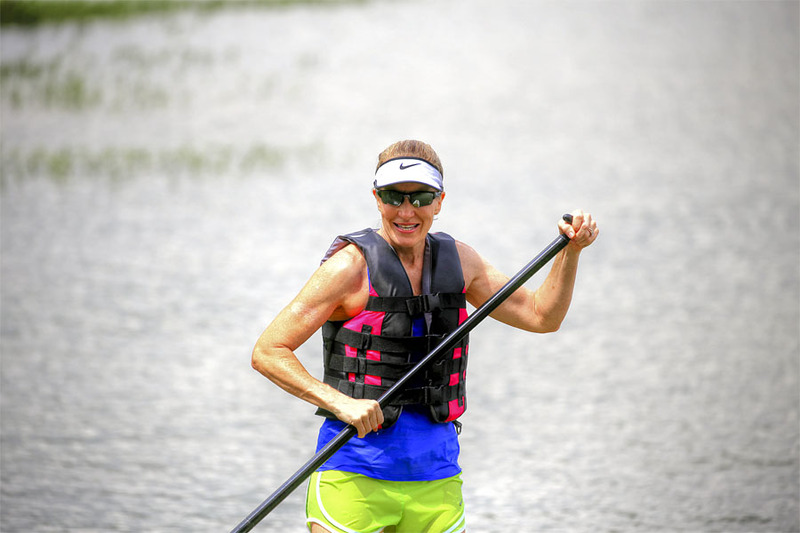 Shortly after my story, I found myself hitting the water again – this time hard. I’m not sure what I did, but I lost my balance big time and this time went completely under. All I could think of was, “Please don’t let me lose my sunglasses (affiliate link) or visor (affiliate link) in the middle of the lake. 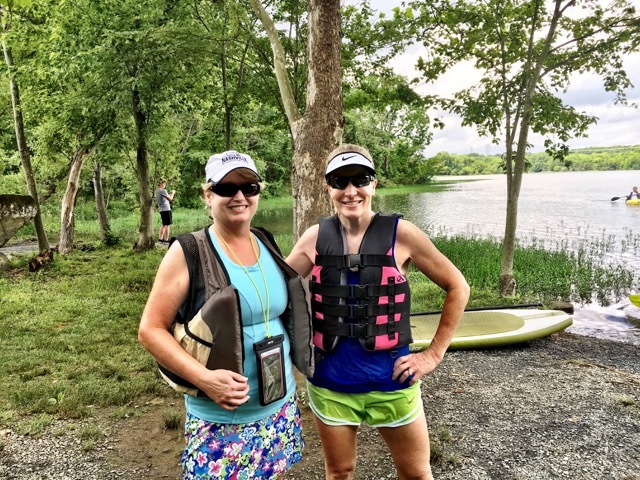 I popped back out of the water looking like a drowned rat and flailing about much like the time I found myself in the middle of the Potomac River. 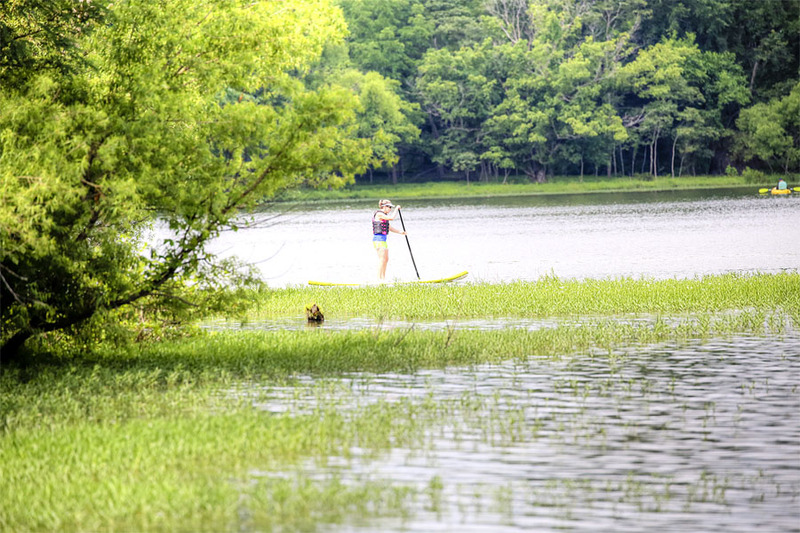 My board was floating away as I clung to Crystal’s board coughing our future drinking water back out of my lungs while wondering how the heck I was going to swim after my board with my paddle in tow. Luckily, Crystal had dropped to her knees so I didn’t flip her off her board, and she let me calm down before swimming (and I’m using that term loosely here) to retrieve my board while she carried my paddle on her board. Unfortunately, Bill did not capture the fall, but noticed that I was in the water and snapped this picture of me as I headed back to my board. 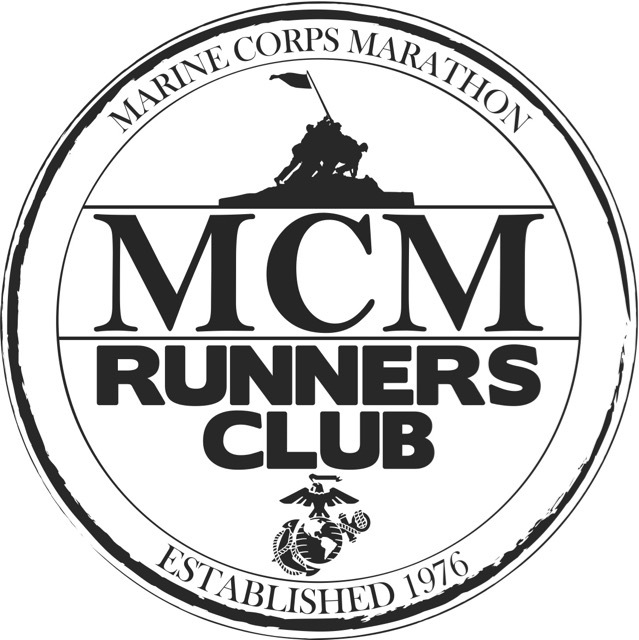 Once I got to my board I clung to it huffing and puffing more than I did at the end of my fastest marathon, and once I got back on that glorious board, I flopped down on my belly happy to be alive. I’m thankful at this point Crystal didn’t fall off of her board laughing at me because I must have been quite a sight! Once I regained my composure, I stood on shaky legs and managed to turn and smile for a picture without falling off my board for a third time. Finally with my composure in check, I felt comfortable on my board, and had a delightful rest of my time on the lake. As we got back closer to shore, Bill picked up on us and started snapping pictures again as we made our way toward him. Once safely back on shore, we posed for a final picture before carrying our boards back to Crystal’s car to be deflated. I had an absolutely fantastic time, and can’t thank Crystal enough for including me on this adventure. I really appreciated her patience as I learned this new skill, and would go out again in a heartbeat! Thank you, Crystal! 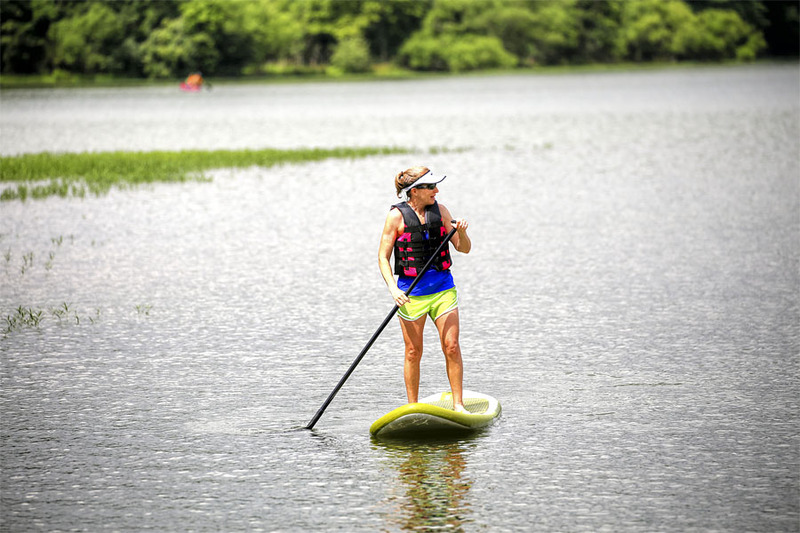 If you’ve not tried SUP and have the opportunity to, definitely give it a try. It’s so much fun! Do you have any close-call water stories to share? Disclaimer: This post contains affiliate links, which means if you click on the blue product link and then make a purchase, I will receive a small commission for referring you. You will pay no more or less for the product; however, Amazon will show their gratitude for my referral by paying me. 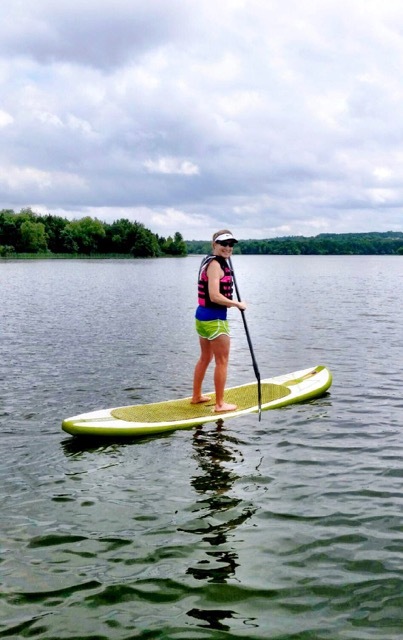 My sister and her friends paddle board. Some of them even bring their dogs and they sit right on the board! I have a Labrador who loves water so i’d like to try it with her! I think it’s so cute when I see pictures of dogs on paddleboards. Unfortunately, the reservoir doesn’t allow dogs, so I didn’t get to see any out on boards with their people. 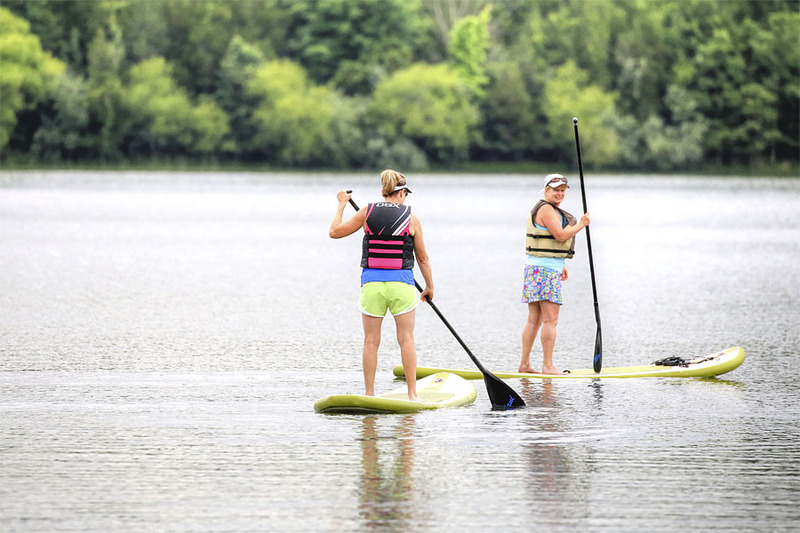 I am sooo glad you tried paddle boarding – it’s one of my favorite activities. 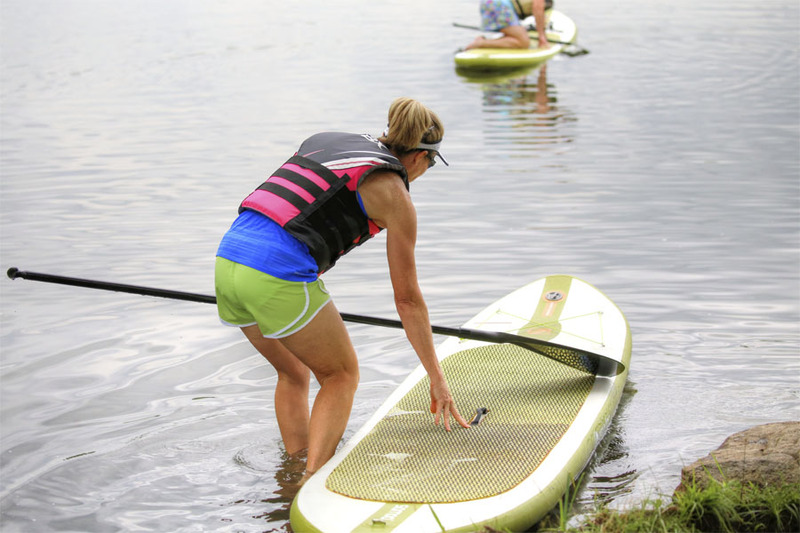 Before we bought our own boards, we rented them from Paddle Nova — they are wonderful people. We will be out there all weekend – let me know if you head back out! There are lessons near me and I would like to try. I’ve just have been hesitant to sign up lol I guess there aren’t sharks in the James River, but I am always worried about what I am falling into and I know I am going to fall! Yeah, I don’t think there are sharks in the James! 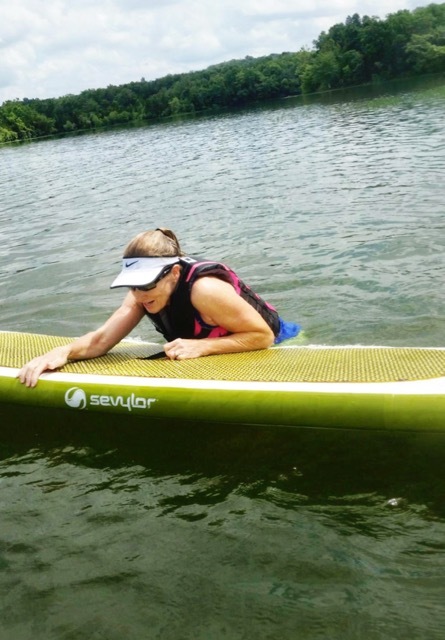 Of course, I can’t guarantee how clean the water is… I do encourage you to try SUP. You’ll love it! I have never tried SUP, but am (slightly) interested. I’m not very graceful, and my balance is meager…but yoga has made my balance much better, so who knows? How deep was the water? I researched, but couldn’t find an answer to your question. I did learn that the reservoir is 350 acres, and from an ariel view photo of when we had a drought several years ago, I looks like it’s REALLY deep! Yoga is so great, isn’t it? It has so many healthy benefits! I want to try but am scared. I don’t swim well and have horrible balance. I once fell waterskiing and broke my foot. It’s on my bucket list, too. I was just looking at classes last night, but at the moment it’s on hold because we might have something going on. Or not! Luckily I am a strong swimmer. Slow, but strong (although that doesn’t mean I have good form, simply that I can swim a long time!). 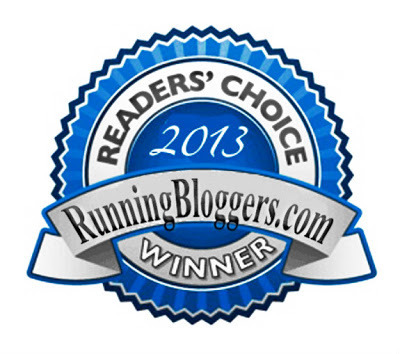 Judy @ Chocolaterunsjudy recently posted…Delirious: let’s go crazy! I have yet to paddleboard but will some day! 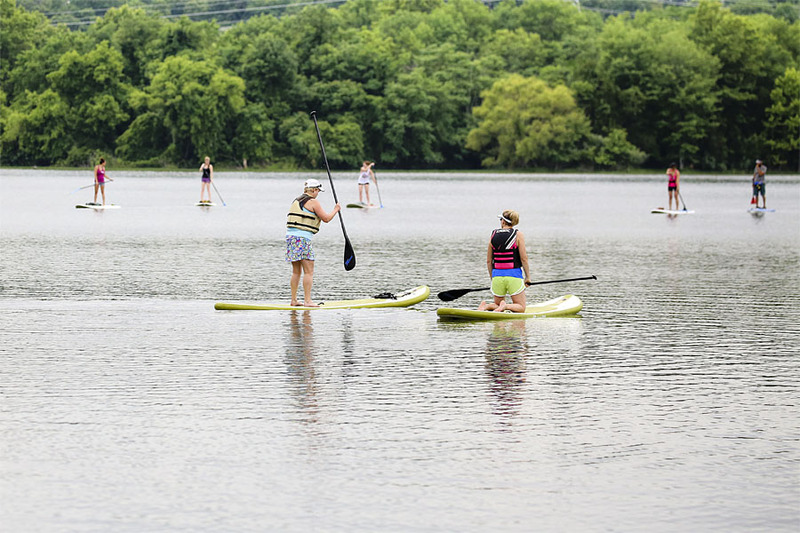 We have sit-a-top ocean kayaks so it’s easy to stand on one and pretend it’s a sup. Did you like it that it was a blow-up sup? It sounds like a ton of fun and I’m glad it was a great spur of the moment adventure! Yes, I really liked the blow-up board. Crystal and I talked about the blow-up versus hard board, and I decided that the blow-up is probably more forgiving on my feet. Toward the end I was slightly aware of my heel, and I think standing on a hard board would make my feet get tired more quickly. I wear custom orthotics and my feet really miss the support when I’m not wearing them. That’s so cool! I’ve always wanted to do that, but I can’t swim. Maybe someday! Since I’m not really a very strong swimmer, I wouldn’t SUP without wearing a life jacket. How fun!!! My husband and I took a SUP yoga class on our honeymoon and it was SO fun! 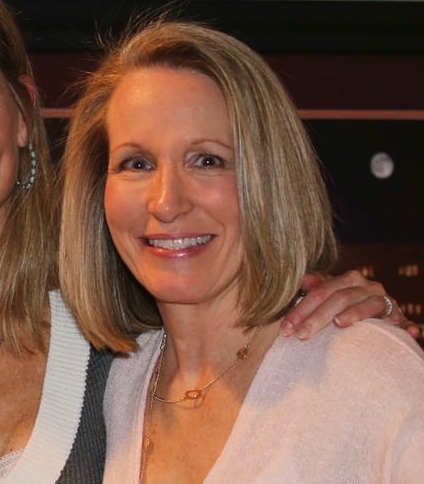 Great job, Deb! 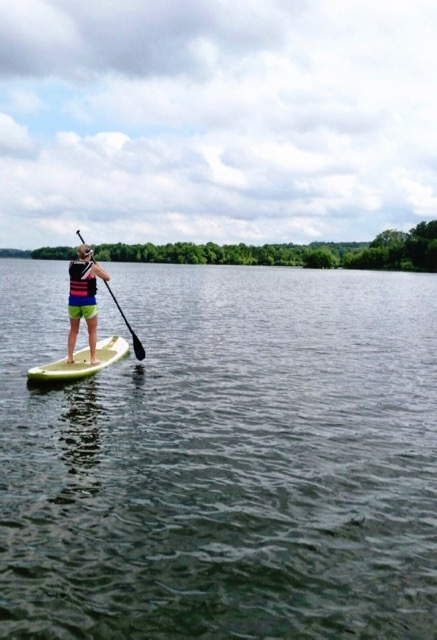 Paddle boarding is so much fun once you get the hang of it! So glad you enjoyed yourself! I not only survived, but I had a great time and can’t wait to try it again! Thanks, Jason! I’m bummed that the reservoir is closed for the next two summers for maintenance.